We are happy to place on record and report the success story of ECCLIRES-2013, the second National convention on clinical research in conservative dentistry and endodontics. The second National convention on clinical research in conservative dentistry and endodontics. "An an initiative of IACDE)"
Encouraged by enthusiasm and interest evinced by the participants of 2012 National convention of ECCLIRES [Figure 1], first of its kind, focussed on clinical research, we at Sree Balaji Dental College, Chennai made elaborate arrangements for the second National Convention in August 2013. 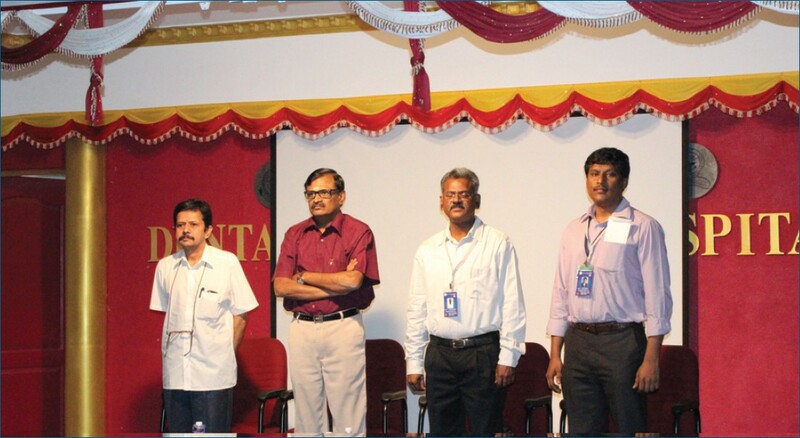 The convention was held at Sree Balaji Dental College campus, which is celebrating its silver jubilee year, on 10 th and 11 th of August 2013. There were delegates representing various colleges from all over the country. Dr. V. G. Sukumaran, Chairman, Organising Committee, welcomed the gathering in the august presence of Dr. L. Lakshminarayanan, Hon. General Secretary, IACDE and Dr. M. R. Srinivasan, President elect, IACDE as guests of honour. The eminent presence of well known academicians like Dr. V. Gopikrishna, Dr. N. Velmurugan, Dr. A. R. Pradeep kumar, Dr. S. Mahalakshmi, Dr. Niveditha, Dr. Arthi Ganesh, Dr. Krithika Datta and others, whose timely intervention and crisp comments, made the proceedings vibrant and memorable. Presentations by the invited speakers, Dr. K. Padmavathy and Dr. Krithika Datta on Clinical research in Microbiology and Clinical research methodology respectively gave a new insight into these subjects. They are bound to motivate and involve many youngsters into clinical research. It also dispelled the impression that clinical research is time-consuming, and expensive to undertake. We are immensely pleased with overwhelming response and the resounding success of the convention. As compared to last year there were more participants with increase in oral and poster presentations. The papers were not merely quantitatively more but also qualitatively very impressive. The fact that those papers were submitted by post-graduate students and young faculties augurs well for a bright future in clinical research. At the end of the convention it was decided to encourage cross-sectional studies of regional population, randomized control trial with proper guidelines such as CONSORT guidelines, intervention studies, studies of screening and diagnostic test, outcome studies, case-control series, and surveys with high response rate. Regarding case reports, cases with high clinical significance or implications with proper documentation, high quality images, proper post-endodontic restoration with 12-18 months follow up will be given priority. Six best papers were selected in this convention which competed in the final session. Overall best paper was awarded to Dr. C. Praveen Kumar of Thai Mookambiga Moogambigai Dental College, Chennai, for the paper titled "Assessing the prevalence of dental caries among the palaiyar community in Tamilnadu", which carried a Rolling Shield and a cash prize. Second best was awarded to Dr. Praveen Rajesh of Bapuji Dental College, Davenegere, for the paper titled "Comparative evaluation of a low level laser and topical desensitizing agent for treating dentinal hypersensitivity- a randomized controlled trial." Increase in clinical research will take our country to a higher pedestal. Hence we, the ECCLIRES team, wish a greater participation from faculties and post-graduate students from all over the country for the ECCLIRES convention 2014. Overall best paper - Assessing the prevalence of dental caries among the palaiyar community in Tamilnadu by Dr. C. Praveen Kumar, Thai Mookambiga Dental College, Chennai. Overall second best paper - Comparative evaluation of a low level laser and topical desensitizing agent for treating dentinal hypersensitivity- a randomized controlled trial by Dr. Praveen Rajesh of Bapuji Dental College, Davenegere. Calcium silicate cements in endodontics - MTA to new generation calcium silicates - a paradigm shift by Dr. Divya Sinha of Faculty of Dental Sciences, Sri Ramachandra University. One-step apexification using biodentine - a case report by Dr. Harish Mullaguri of Meenkshi Ammal Dental College. A comparative evaluation of biodentine with calcium hydroxide used as direct pulp capping agents - a clinical study by Dr. Dhanya Shaji of Govt. Dental College, Kottayam. Clinical and radiographic assessment of modified injectable gutta-percha technique by Dr. Archana .D of Thai Mookambiga Dental College.